Nearly 80 miles of "smart motorway" will be created in the North West over the next five years as part of a £1.5bn investment programme in the region's roads. 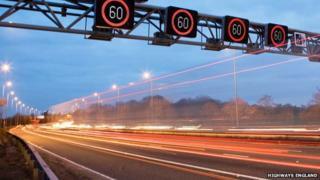 Highways England has revealed plans to begin work on seven new smart motorway projects by 2020. This is in addition to the 17-mile scheme under way on the M62 and M60. The agency said the schemes would make roads safer, cut congestion, and improve journey times. The plan amounted to the "biggest increase in capacity on the region's roads in 50 years", it added. Technology will be installed to monitor traffic, provide information to drivers, and ease congestion by using variable speed limits and utilising the hard shoulder. Two of the schemes on the M62 will link up with existing projects, creating the "biggest single stretch of smart motorway in the country", covering nearly 60 miles between the North West and Yorkshire. Where will the new smart motorway projects be? Other major schemes planned included bypasses on the A556, A585 and A57, new motorway junctions on the M55 and M56, and junction upgrades on the M6. Road resurfacing, safety and lighting improvements were also scheduled. Highways England Major Projects Director for the North, Jeremy Bloom, said the schemes would bring "significant long-term benefits" to drivers and the economy as a whole. "The construction work will, of course, bring some disruption in the short term but we will ensure that we keep this to a minimum to keep traffic flowing. When the schemes are completed, road users will experience safer, more reliable and less congested journeys," he added. However transport group, Campaign for Better Transport (CBT) said it was concerned about the "gung-ho way the government is pressing on" with smart motorways because of concerns over safety and air pollution. Road Campaigner Sian Berry said: "We know from Highways England's own assessments that the risk of some types of crashes is increased three times by getting rid of the hard shoulder. "And the government has been ordered by the Supreme Court to write a new air pollution plan that may rule out wider roads altogether."